There’s something unequivocally graceful about how this book starts. It’s 2001 and the book’s protagonist, Leo Hunter, is writing about his dying father with such a broad and controlled beauty, that one is compelled to delve ever further. Ever further into the book as well as one’s own imaginary hinterland of languid, lurking grief. The sort of which neither resists nor desists the notion that tranquillity could ever reside amid anything other than that of the norm: normality (whatever that is), the everyday, razor edged equilibrium, of the here and now. Admittedly, assorted readers might home in on the discrepancy between ‘’three days pass’’ over ‘’a five day period’’ which; to all intents and nit picking purposes, really isn’t a big deal. As at this stage, what Andrew J Keir is actually writing about, blows all such inconsistencies into oblivion. The problem, if such be the word, arises later in on in the book during ‘A Day at the Races,’ wherein the speaker’s voice suddenly changes from that of Leo (the father and the husband) to that of Diana (the mother and the wife). Not only is the reader not really ready for the unforeseen change in literary gear, but the warmth and plausibility of the new voice is completely different to that of what we’ve previously read and become accustomed to. ‘’She’ll just have to deal with it’’ isn’t something Leo would have said. These seven appalling words leap out of the page with all the brash selfishness of a Celebrity Big Brother contestant (and even though perhaps they’re meant to, they’re more jarring than they are telling). Having thus far been procured by the rather sympathetic voice of Diana’s well-meaning, believable husband Leo; we, as readers, just aren’t readily attuned to such an abrupt and acute alteration of tonality. This, plus the fact that some of the book’s characters would probably benefit from being allowed to bloom a little more – as opposed to merely being contingent upon chronology – is what holds Bloody Flies back from a being a terrific read. 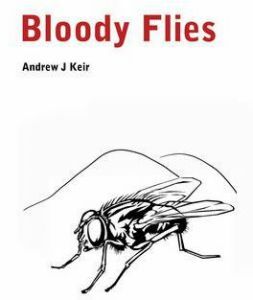 This entry was posted in Novels and tagged Abu Dhabi, Andrew J Keir, Expats Life, Read. Bookmark the permalink.